OFWs in the Middle East can stop worrying about packing their bags and leaving on a jet plane for their beloved Philippines. The estimated 1.4 million land-based OFWs there will not be shipped out if the US attack on Iraq escalates into a regionwide conflict. Retired Gen. Roy Cimatu, chief of the newly formed Philippine Crisis Management Team, which is tasked with ensuring the safety of OFWs in the Middle East, said Filipinos will just be relocated from areas affected by war to safer locations within the region. 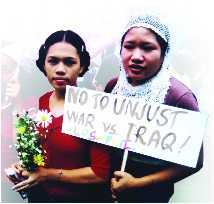 These two Pinay commemorated the 9/11 attack in front of the US Embassy in Manila by bringing flowers and calling for peace. of the huge cost of flying all OFWs out of the region. Besides, many OFWs who have made Saudi Arabia their second home prefer to stay and continue working there than end up with no job and income back home. There are an estimated 800,000 OFWs in the kingdom alone. The previous contingency plan prepared by an inter-agency committee led by the Department of Foreign Affairs (DFA) and Department of Labor and Employment (DOLE) involves three stages of evacuation depending on the severity of the situation. Ferdinand Victoria of the office of the DFA Undersecretary for Migrant Workers Affairs explained that the plan is basically to move out Filipinos away from conflict areas. The first stage is moving OFWs within the country where they work. The second stage is to move them to another country in the region. The last stage, which considers worst case scenario, is the full evacuation of Filipinos from the entire region. Victoria said there is a crisis manual that identifies what necessitates transfer, relocation and full evacuation. For example, if the conflict is full blown and all telephone lines break down, full evacuation is necessary. The relocation plan has a similar principle of moving people away from hotspots. For example the 160,000 Filipino workers concentrated in the Saudi Arabian cities of Alkhobar, Damman and Dahran in the Eastern Province shall be relocated to the capital Riyadh in the Central Region. Iraq fired Scud missiles to the Eastern Province during the 1990 Gulf War because Saudi Arabia joined the international coalition that freed Kuwait from Iraqi troops. It is expected to be the target of Iraqi missile attacks again because of the oil fields, naval base and desalination plants there. If the situation gets worse and Riyadh be placed in danger, the workers shall be relocated farther to Jeddah in the western part of the kingdom. For Filipinos in other parts of the region near Iraq, particularly Kuwait, they may be transferred to Cyprus, Jordan, Lebanon, Iran and Oman. However, the 121 Filipino workers and embassy personnel in Iraq were transferred to Amman, Jordan on the second week of September. From there, they were flown to Manila via commercial airlines. Calling all undocumented Filipino migrant workers in Italy. You can legalize your stay in Italy by applying for amnesty at local labor offices and paying a 300 euro fee (about P15,440). The Italian government is giving foreign caregivers the chance to apply for a regular working permit until Nov. 9. The deadline for registration of illegal domestic helpers was Oct. 9. Caregivers who will register will be given six months to find a job and if they get one, they will be issued a permit to stay. But after the amnesty deadline, undocumented foreign migrant workers will be arrested and deported. Italy would pay for the deportation expenses. The amnesty program was launched in accordance with a recently passed immigration law that provides that “only” foreigners with existing work contracts will be granted permits to stay. The law also ensures the rights and benefits of foreign workers. Up to 80,000 of the 150,000 Filipino migrant workers in Italy are believed to be undocumented. Undocumented Filipino workers in South Korea have more time to legalize their stay than those in Italy. The Seoul government offered the 230,000 illegal aliens staying in the country, including 17,000 Filipinos, until March 2003 to regularize their stay to avoid deportation. Sen. Tessie Aquino-Oreta can now heave a sigh of relief after the DFA assured that immigration authorities are not rounding up Filipino entertainers in Japan for deportation. The Philippine Embassy in Japan reported that Japanese authorities are raiding nightclubs not to harass the entertainers but to ensure that its owners are not forcing their foreign workers into prostitution. DOLE Secretary Patricia A. Sto. Tomas said the inspection of clubs and restaurants, where thousands of Filipina overseas performing artists (OPAs) work, is also meant to penalize club owners and foreign workers violating Japanese taxation and immigration rules. She said Japanese immigration strictly enforces the rule that duly certified dancers and singers must perform. OPAs found working without the permits or sitting with customers are penalized . Sto. Tomas said at least 100 promoters have been suspended because of the annual inspection conducted by a reorganized Tokyo Regional Immigration Bureau since last April. Members of the Alyansa ng mga Samahang Pilipino sa Ibayong Dagat (Alyansa), which groups 50 Filipino organizations in the Western Region of Saudi Arabia, donated used clothing, canned foods and other items for the benefit of Filipinos deported from Sabah, Malaysia. The donations consisted of 32 boxes of quality clothing and two boxes of assorted medicines with a combined weight of 700 kilos. The clothes were shipped via sea and the medicines via air to the Philippine National Red Cross (PNRC) in Manila for handling and distribution. Alyansa also collected more than 500 riyals from different individuals for the benefit of Sabah refugees and transfered the money to the PNRC’s account. The donation drive is still ongoing. Filipina caregivers Adelina Cunanan and Rebecca Ruga died instantly when a suicide bomber exploded on a bus they were riding in the hills of Galilee in Israel last August. But for the 20,000 undocumented Filipino workers in that troubled country, their worse fear is being discovered and repatriated than getting killed in a suicide bomb attack. The Israeli government is targeting the expulsion of 50,000 unauthorized foreign workers in the country this year. Most of the illegal Filipino workers in Israel are caregivers. The DOLE already issued a warning not to work in Israel because of the crackdown and violence. But for those who will be deported, OWWA assured that it would give assistance whether or not a deportee is a member of the agency. From January to September this year, 638,875 Filipino workers left for work abroad. The POEA reported that 497,577 land-based workers and 141,298 seafarers were deployed during the eight-month period. The POEA added that 309,538 of the deployed land-based workers were rehires, while the remainder, or 188,039, were new hires. And if the daily average of 2,618 deployment continues up to December, the number of deployed OFWs will reach one million this year, DOLE Secretary Patricia A. Sto. Tomas predicted. Sto. Tomas said foreign-based employers continue to hire Filipino workers because of their competitiveness. Aside from their highly rated skills, reliability, and productivity, Filipinos are culturally adaptable and can clearly and fluently communicate in English, the accepted international language, Sto. Tomas said. Last June was the second instance under the term of Professional Regulation Commission chairman Antonieta Fortuna-Ibe that many marine deck officers scored impossible high grades in their licensure exam. Many examinees scored 94, 95 and 96 in two subjects of the written exam and a “kodigo” containing many answers to the test questionnaires was found. So Ibe held the release of the grades until a multi-agency team finishes its investigation of a possible breach in the supposedly fool-proof computerized examination. The holding of the release of the grades forced many marine deck officers to delay their deployment abroad. Reminiscent of the July 2001 deck officer licensure exam, wherein several examinees scored perfectly in one subject, investigators could not find the people who rigged the June 2002 exam. Last year, the National Bureau of Investigation and the Criminal Investigation and Detection Group also failed to find enough evidences of a leakage of test questions and answers to a review center, where the perfect scoring examinees studied. You can now apply for renewal of your passport via the Internet. The DFA is providing the service at http://www.passport.com.ph. Through the DFA Passport Direct Online, a passport can be delivered to your home in six days. Door-to-door delivery is from Monday to Saturday. The online passport renewal costsP1,300. DFA Passport Direct Online also allows verification of the status of renewal application. The service is as convenient as the DFA’s passport renewal via telephone (DFA Passport Direct Hotline: 737-1000). No more traveling to and queuing at the DFA. The service is P100 cheaper than the phone application, which costs P1,200 - P550 for the service fee and P650 for the passport. It is even cheaper than getting passports from travel agencies, which charge P1,500 to P3,000. Pilipinas Teleserv, Inc., the company that introduced phone application of birth certificates from the NSO, runs the DFA Passport Direct Online and Hotline. Overseas Filipino seafarers are throwing the Migrant Workers and Overseas Filipinos Act of 1995 (Republic Act 8042) to the dustbin. Participants to the Filipino Seafarers’ National Convention proposed a separate law that exclusively protects seafarers and promotes their and their families’ welfare. The convention was held last Sept. 27-28, 2002 at the Manila Hotel as part of the annual National Seafarers Day celebration. RA 8042 provides policies of overseas employment and a higher standard of protection and promotion of the welfare of OFWs, their families and overseas Filipinos in distress. But the law was seen as favoring only land-based OFWs. In contrast, the Magna Carta for seafarers will include guidelines for education and training, licensure, just wage, safe working conditions, social benefits, health and safety, dispute settlement, legal assistance, rights and protection, welfare services and facilities, port employment, repatriation, reintegration and replacement. Before leaving for abroad, the DOLE requires an OFW to attend a pre-departure orientation seminar (PDOS). The PDOS orients OFWs on the culture of their host countries. Now, the DOLE will also conduct a pre-employment orientation seminar (PEOS) to orient Filipinos about the dangers of working abroad without proper documents. The PEOS aims to prevent a repeat of the deportation of thousands of Filipinos working illegally in the Malaysian province of Sabah. The POES, which will be jointly conducted by POEA and local government units representatives, also aims to protect jobseekers against illegal recruiters by informing them the names of accredited recruitment firms. Attendance to a PEOS will be a requirement before an OFW is accepted for an overseas job. All new hires recruited by licensed recruitment agencies and POEA’s Government Placement Branch can now get their OFW Electronic ID Card for free at the POEA main office in Mandaluyong City. The POEA started issuing the credit ID card on October 1, 2002. All pertinent data about an OFW will be loaded in the card such as name, picture, signature, position, name of employer, place of destination and OFW ID number. The card can be used to buy goods or pay services in millions of establishments around the world. It can be used to deposit and withdraw cash in any Bancnet and Megalink ATMs in the Philippines or at any Visa Plus ATMs worldwide if the holder opens a peso savings account at the Equitable PCI Bank, an affiliate company of the card-maker Equitable Card Network. Eventually, the wives, allottees or dependents of OFWs will be given similar ID cards to withdraw money from their husbands’ or fathers’ bank accounts. With the ID, an OFW can easily obtain monetary assistance and claim benefits just by showing it to OWWA officers. It can also be used to check details of OWWA contributions or medical insurance, scholarship and repatriation benefits. Be warned that the First Gift Global Realty Corporation (FGGRC) is not authorized by the DOLE to recruit workers. In fact, the DOLE Region IV ordered the closure of the FGGRC offices in Sta. Rosa and Biñan, Laguna. Regional Director Ricardo Martinez Sr. issued the closure order after FGGRC failed to show proof of authority to engage in recruitment activities in the said municipalities during a hearing on September 3, 2002. DOLE inspectors found out that FGGRC posted fictitious job vacancies with “unusually” high salaries. It was allegedly in need of machinists, electricians, plumbers, engineers, data encoders, office staff, filing clerks, utility men, construction workers, mechanics, and welders among others. DOLE said the company was using houses and makeshift structures as offices and employed volunteers as staff. Martinez also ordered the appropriate filing of criminal charges against the company. Filipinos in the Western Region of Saudi Arabia can have a chance to buy their dream house in the Philippines at the Pag-IBIG Fund housing fair on Oct. 31 to Nov. 1 at the Philippine Consulate General in Jeddah. Ten realty companies will offer low-cost and middle-income housing units during the fair. Also, buyers may finalize documentations with the Pag-IBIG Fund and the housing companies during the fair. Pag-IBIG Fund representatives will also accommodate membership applications at the Consulate in Jeddah or the Philippine Embassy in Riyadh. OFWs who are not yet members of Pag-IBIG are encouraged to apply so they can loan money to buy, build or renovate a house anywhere in the Philippines.